Vitamin B12 or cobalamin, is a water-soluble vitamin which is required by the body for a healthy brain, nervous system and red blood cells. This vitamin benefits your heart, mood, skin, hair, digestion and energy levels. Lack of vitamin b12 can show up symptoms such as tiredness, fatigue, depression, stress and mood disorders. Vegetarians, heavy alcohol drinkers, pregnant women and elderly depend on vitamin B12 supplements to meet the requirement and to prevent its deficiency. Diabetic neuropathy is common in individuals with long-standing diabetes. It affects the nerves and can cause damage throughout the body. Worsening of diabetic neuropathy is observed among individuals with vitamin B12 deficiency. A lack of vitamin B12 can degenerate the spinal cord and cause damage to the nerves. Furthermore, insufficiency of this vitamin destroys myelin, outer protective covering that surrounds the nerves of the spinal cord and brain. Vitamin B12 plays a crucial role in neurological function. Its deficiency is associated with depression, irritability, personality change and anxiety. Literature has found a positive link between vitamin B12 deficiency and depression. High levels of homocysteine, an amino acid has a direct effect on brain chemicals implicated in depression. Treatment with vitamin B12 lowers homocysteine and inflammation associated with it. It enhances the production of brain chemicals that help in maintaining brain function and boost positive mood. Without adequate vitamin B12, brain chemicals cannot be released at normal rates. Therefore, signs and symptoms of poor mental and emotional health such as depression can arise. Deficiency of vitamin B12 is associated with altered lipid profile. Vitamin B12 inhibits accumulation of fat in the body. It boosts the breakdown of fat from the food you eat and helps in obtaining energy from it. 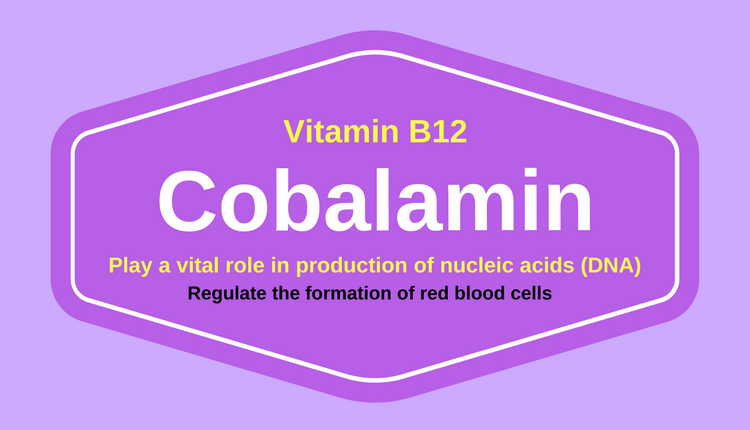 Lack of vitamin B12 reduces the production of red blood cells in the body and causes anemia. This can make you look pale and feel tired and weak. Insufficiency of vitamin B12 causes laryngeal hyperresponsiveness and chronic cough. Such a deficiency favors sensory neuropathy, which in turn plays a role in chronic cough. Individuals with lack of vitamin B12 are at a greater risk of nerve damage, inflammation of the larynx and constricted airflow. All these factors contribute to coughing. Elevated homocysteine level, which is common during vitamin B12 deficiency is associated with high level of histamine. Such high levels in the respiratory tract results in chronic cough. Elevated homocysteine concentration is a risk factor for heart diseases. Individuals with low intake of vitamin B12 are at a greater risk of having high levels of homocysteine and developing heart diseases. Vitamin B12 promotes breakdown of homocysteine and keeps the level of this compound low. It further inhibits clot formation, damage to the arteries and oxidization of LDL cholesterol. Adding vitamin B12 to your daily diet can lower homocysteine level by 7%. Not getting sufficient amount of vitamin B12 increases abnormal cholesterol levels. Such an increase blocks blood flow to the heart. This weakens the heart and puts it at a risk of heart attack or stroke. Literature has found that low levels of vitamin B12 is associated with accelerated cognitive decline and may contribute to Alzheimer’s disease. Deficiency of vitamin B12 raises the level of homocysteine in the body which in turn has a negative effect on brain function, memory and ability to think. Homocysteine decreases acetylcholine, a vital brain chemical that acts as a messenger and assists in carrying signals to other cells. Imbalances in acetylcholine lowers the ability to form memories.